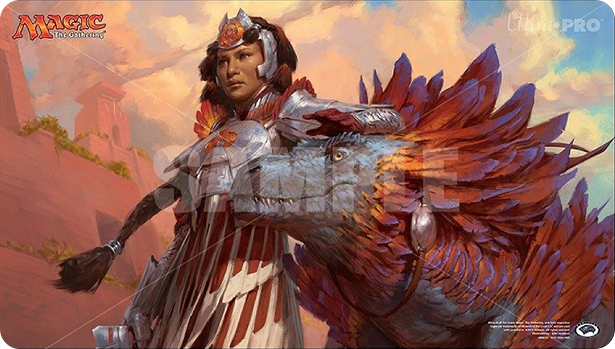 Hello and welcome to the first weekend of Ixalan! I hope you’re going to have a great time at your local Prerelease, and every three months, I have the same advice: Trade it all! These prices are at their highest for 95% of cards, and I will just play it safe and trade them all away. I’m going to be highlighting one or two things that I think have potential to rise, but I expect almost all of these to fall. I’m going to start with the preorder prices, which have been really active for some of these cards. I love nothing more than preview season, though I really don’t like the giant dump of cards we got at the beginning of the week. That’s too much all at once for me to process and I suppose that means I’ve completely come around to like Wizards’ method of revealing the new set. At the same time, thought, we have dinosaurs! Pirates! All kinds of tribal goodies! Most relevant to us is that preorder season has begun. 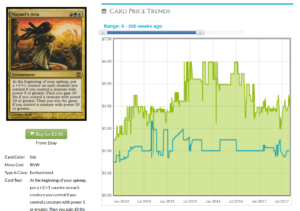 I know that usually, preodering is a really terrible idea, but recent sets have gotten better about preorder prices. It’s gotten to the point that so many stay away, and wait, and then some cards went up. Today I want to look at some of the preorder prices and see if anything is worth getting in on. Walk the Plank ($.50 preorder) – The flavor is amazing, and it’s a good card for just two black. It’s a sorcery, though, so this is not Fatal Push. It’s a bit worse than you think it is, being a sorcery. Very fairly priced. Old-Growth Dryads ($3) – If you weren’t playing a basic before, then it’s time to do so. I think this has potential to grow, especially in foil. The presence of Path to Exile in Modern and Ghost Quarter have pushed people to include a couple of basics (even Tron with a miser’s Wastes, so this isn’t the slam dunk you want it to be. Best friends with Leonin Arbiter. There’s a very good chance that given the manabases possible in Standard, we’d skip out on basics when we want multicolor lands. This is the penalty for that strategy, and might be a more popular sideboard card than maindeck. In either case, this isn’t worth the $3…yet. Revel in Riches ($0.79) – First of all, yes, this works with Anointed Procession. Alternate win conditions. Doubling token creation! I want this to be good, I really do, and it is going to be good in some sort of black control deck. I don’t think I like it as much as Approach of the Second Sun, though, so I don’t see this budging. Herald of Secret Streams ($1) – This is pretty great in the strategies that want it. 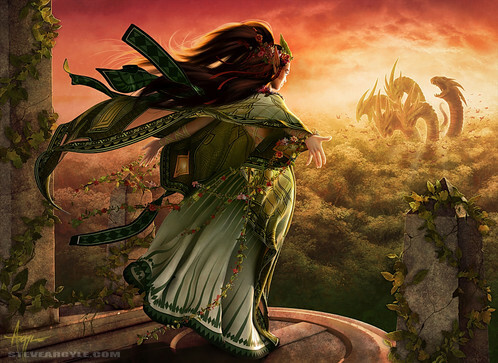 Thankfully, Nissa, Voice of Zendikar just rotated out and so people are going to have to go back to Verdurous Gearhulk/Rishkar, Peema Renegade for their counter needs. The downside is that you won’t want lots of this in your deck, as they don’t stack. I think it’ll have a good showing and make $2, but that might not be right away. Foils are a different matter, and given the appeal in Commander, I love foils of this at $5 or less. I wonder if this is a seed for a future set, given how +1/+1 counters aren’t a strong theme in this set. Sanguine Sacrament ($0.50) – Pure lifegain is bad, but this is going to rise from the bulk in a few years. I have trouble seeing it as more than bulk while it’s Standard legal, though. Tocatli Honor Guard ($2) – Torpor Orb is a very powerful Commander card if your opponents are addicted to value creatures, but having this effect in Standard is terribly intriguing. This dies to every removal spell being played, though, including a non-revolted Fatal Push. I think this price is spot-on for now, and in a couple months when it’s fifty cents, I’ll want to have a few tucked away. River’s Rebuke ($1.50) – I despise this card, but at least it’s a sorcery, and not an instant as Cyclonic Rift is. I’m going to be picking up every foil I can at $3-$5 right away, though. 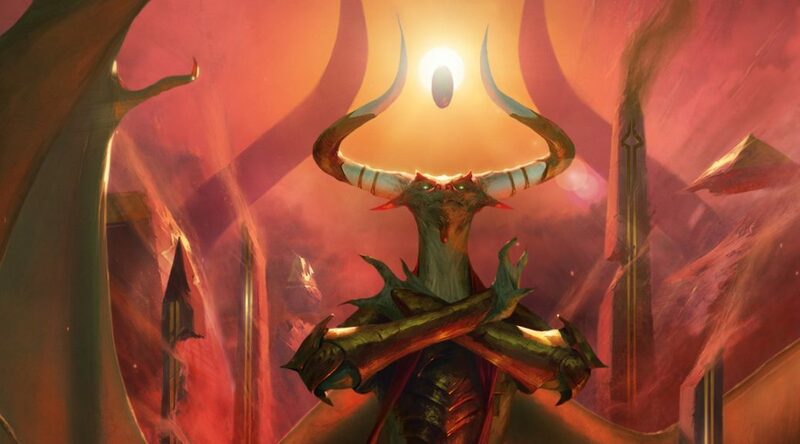 Sunbird’s Invocation ($0.50) – I love what this does, and I think there’s both some really strong long-term potential and yet there’s also a very high reprint risk. This is exactly the type of card that will be in Commander 2019. 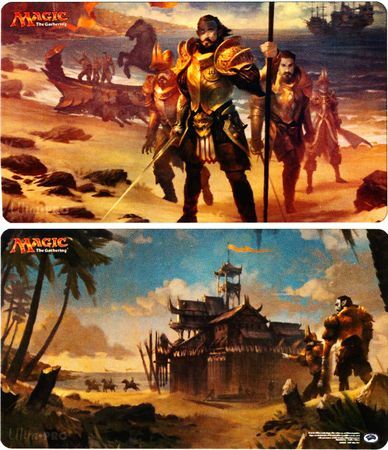 I will be picking some of these up for the casual appeal, especially in foil. Settle the Wreckage ($1.50) – Too high a price. Commander won’t run this, and other formats likely won’t either. You’d need an absurd ratio, something like exiling three creatures and them getting just one land. Carnage Tyrant ($8) – Not as good as Thrun, the Last Troll in Modern, so that outlet is gone. We have had a few giant hexproofers printed before, and Plated Crusher is about to rotate out. Same card, one less mana and can’t be countered. This is a trap. Don’t buy this unless you’re hellbent on doing this deck in week one. This might well be a good sideboard card, but those don’t tend to be this expensive. Some have said it’s a mythic for Limited, and it’ll end up pretty cheap. Kopala, Warden of Waves ($2) – We are going to need to see more Merfolk to know if this is good in Standard. I’ll let you decide if you’d rather play this or play Kira, Great Glass-Spinner in your Modern Merfolk deck. I don’t want nonfoils yet, but I’ll be listening if the foils have a reasonable price, around $5. 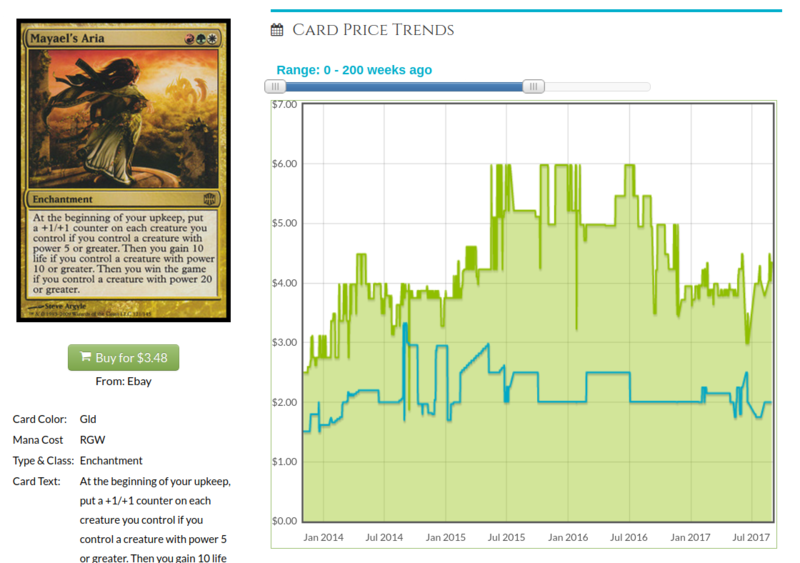 The foil of the Aria can be had for $7-$8 right now, and that price isn’t going to last. I think $7 is a touch too high for Gishath, but I also think the casual appeal is through the roof on this. Deeproot Champion ($1) – This is underpriced, to my mind. 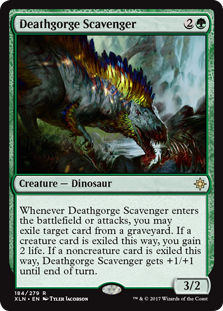 There are a lot of decks where this is better than Tarmogoyf, though the Champion has vulnerability early on. This can be thought of as permanent Prowess. So if that ability is decent in a deck, this card is bonkers. I especially am hoping to get foils for $3 or less early on. Arcane Adaptation ($2) – Ah, combo pieces. Where would we be without you? I think this is a fair price for the card, but I want foils pretty badly. It’s a cheaper Conspiracy, a cheaper and better Xenograft. Neither of those has moved much, but this is the new one, and backup copies to combo decks are useful. Turntimber Ranger has a new buddy! 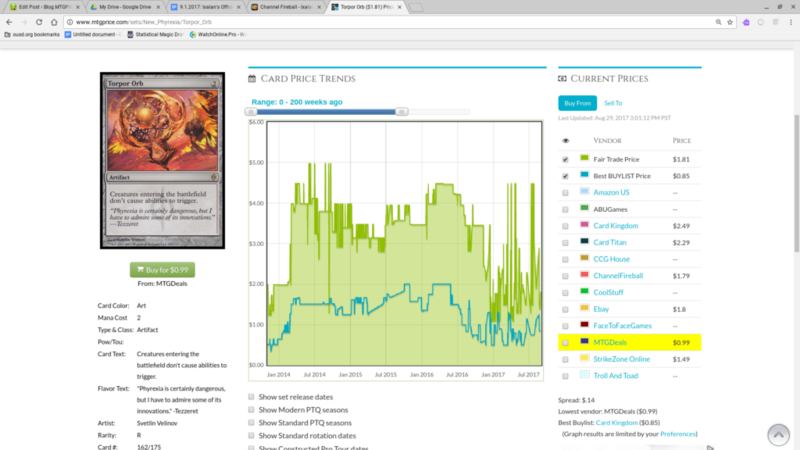 Vanquisher’s Banner ($2) – Travis and I talked about this on MTG Fast Finance, and it’s because this preorder price is too low. This should be $4 or $5. It’s total gas for the tribal decks that Wizards is pushing, and while it is expensive at five mana, it makes all of your creatures cantrips. That’s pretty outstanding, and I look forward to playing both this and Lifecrafter’s Bestiary at every opportunity.